This is a mesmerising mix of murder, mayhem and laugh-out-loud comedy that leaves you exhausted just watching the action unfold. Feargus Woods Dunlop has penned an absorbing tale that has elements of everything from Agatha Christie whodunnits to the legendary Whitehall farces of yesteryear, and even has echoes of those word-play specialists the Two Ronnies. All of this is woven into the story of a group of strangers brought together at a house party on a mysterious island. One by one, as if in an episode of Midsomer Murders, they are bumped off in the most bizarre of circumstances. But why? You are invited to keep up with the body count, and to try to work out who the next victim will be and, of course, the identity of the killer. But it all zips along at such speed that if you blink you will miss the next clever line – or even the next murder. Woods Dunlop is magnificent in the pivotal role of art detective Artridge, as are the three other cast members who between them play more than a dozen characters, instantly adopting different accents and mannerisms, and deftly handling swift costume changes. A tiny yet ingenious set in the Garrick’s intimate studio theatre serves as the perfect backdrop. 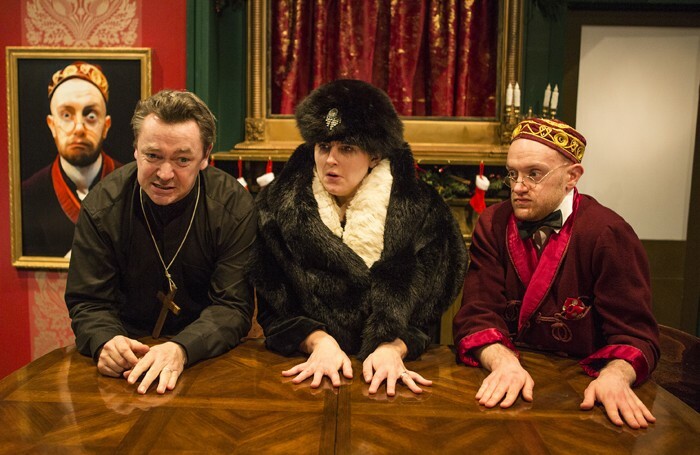 A delightful, fast-moving feast of Christmas-themed, murderous fun.